If you get our monthly newsletter, you know that FRASER adds new material every month that can help economists, historians, and other interested readers learn more about the economy. In addition, we recently updated our search capability to make it easier to find the right information to answer your questions and satisfy your curiosity. What you may not know is how to share these resources with friends and colleagues or how to best keep track of the information you find. If you’re an academic type, you can use FRASER’s compatibility with the Zotero citation manager to capture information about an individual document. For everyone else, here are a few tricks and recent improvements to make navigating to, citing, saving, and sharing documents easier. Sometimes searching the web for economics topics brings you to FRASER but doesn’t quite get you to the document or information you were looking for. Imagine you were looking for information on Chairman Volcker’s “Saturday Night Special” rate rise of October 1979. A quick web search might bring you to the October 6, 1979, Federal Open Market Committee meeting webpage but display the Greenbook instead of the meeting transcript you were hoping for. Although you can always use the buttons and links on the page to get to related content—in this case, clicking the green View >> Transcript button to navigate to that document—you can also now change the URL directly to navigate within the collection. This Greenbook file is part of FRASER title 677, Federal Open Market Committee Meeting Minutes, Transcripts, and Other Documents. (Notice the circled URL, the page breadcrumb: Home > Browse by Title >, and the PART OF: below the green View buttons.) By deleting “item/23038” in the URL to change it to just https://fraser.stlouisfed.org/title/677/, you can get back to the main FOMC meeting collection. 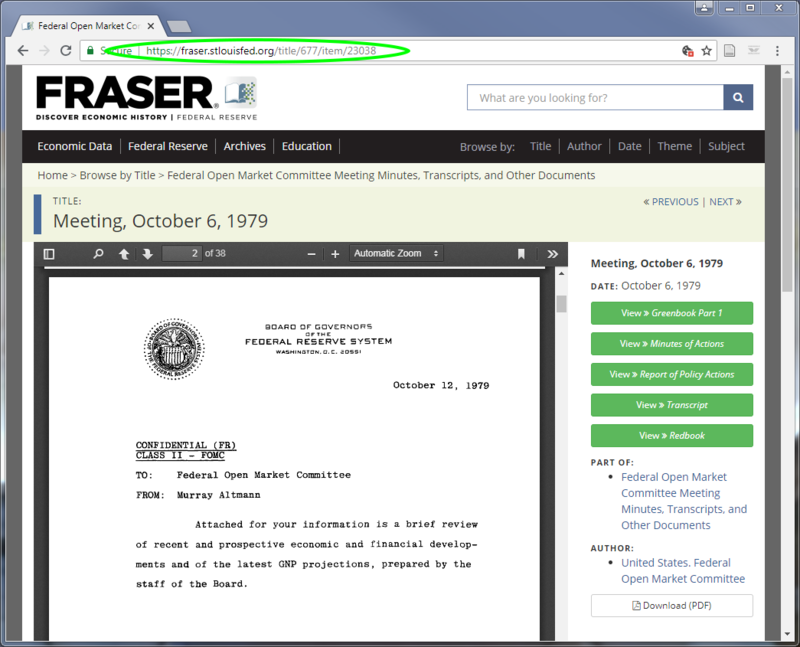 Looking again at the URL, you can see this file is part of FRASER item 23038, which is the record number for the October 6, 1979, meeting. 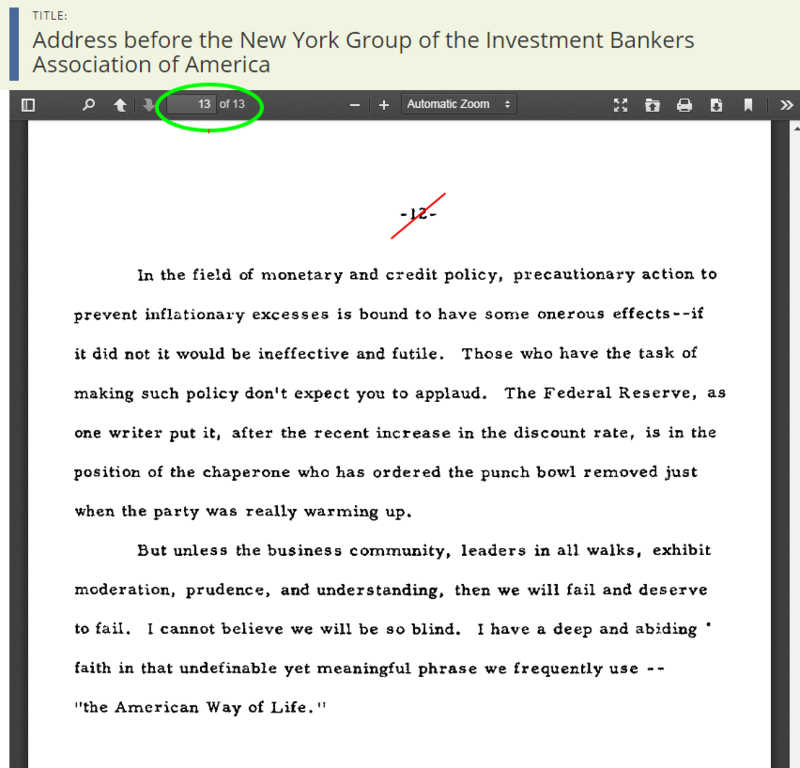 From another page, navigating directly to https://fraser.stlouisfed.org/title/677/item/23038/ will take you to the first document associated with that meeting, the Greenbook. Frequent FRASER users may notice that this is a change from our previous URL pattern. To improve clarity and make this kind of navigation possible, FRASER links no longer include the full path of the related file, which you can still save via the Download (PDF) button. Each URL is now shorter and easier to read and share. Old links will continue to work, but we encourage you to update your bookmarks. Once you’ve navigated to the correct document, you still need to pinpoint the information you’re looking for. Being able to share the link to a specific page in a FRASER document is one of the most useful—and easy-to-miss—functions of the FRASER platform. Using the “Start link at page:” selection below any document, you can generate a link directly to the most relevant information. Sharing a link directly to the punch bowl quote page takes two quick steps: First, check the page of the document you’re viewing in the PDF viewer—in this case, it’s page 13, circled in green in the illustration above. Type the document page number in the box; then either hit “Enter” or click in the gray box where the link is displayed; and the existing link will update to add the page number. This new link can be copied and pasted into another browser or a note-taking app or shared via social media. Note that the share buttons (TWEET, EMAIL, +) will automatically share the base link only, but you can paste the updated link into the generated email or share screen. All tweets will include the FRASER twitter handle (@FedFRASER), and emails will also include “FRASER:” in the beginning of the subject line. Clicking the red plus-sign button next to “EMAIL” will allow you to automatically share FRASER resources through other social networks, including LinkedIn and Facebook, or you can import the link into other web utilities like Evernote or Google Classroom. Each item has a generated citation that includes the credited authors of the content, the title of the item you’re viewing, the title of the collection (if there is one) and the document’s known publication date. The FRASER URL and the date you accessed it are also included. Some citations may have more or less information available for the citation, particularly table of contents entries, archival materials, and documents with unclear dates or authorship. As librarians, the FRASER staff understands that citation is not one-size-fits-all, and these generated citations are provided as a starting point for your convenience. For publication or academic work, always check generated citations against your style guide or a reliable citation resource like the Online Writing Lab (OWL) at Purdue University. To learn more about other ways to get the most out of FRASER, we encourage you to browse the illustrated guide How to Use FRASER. For questions or suggestions, please contact us.